What is the wrap around seating material used? 6. Be a skilled ‘zoner’ Many people with big houses don’t productively use a lot of what they have. An awful lot ends up as dead space, used as corridors or for inessential chests and sideboards. 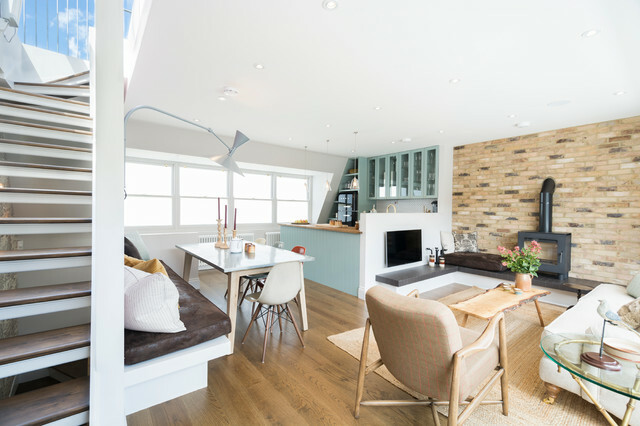 Conversely, in a small house, zoning effectively and ruthlessly is essential, as seen in this snug, open-plan carriage house. The kitchen, dining and living areas are all close together but don’t crowd one another. The key is clearly defining each area so its purpose is obvious. The kitchen counter is a natural divider, while built-in benches by the dining table and under the TV and wood-burning stove are a smart way to keep things uncluttered and neat. 4. Face the right directionThe key to getting an open-plan layout right is to think about which way your kitchen will face. This will have an impact on how sociable the space is, and how much you can benefit from the view outside. For example, by having a sink or stove in the island or peninsula, you can talk to others in the room while you’re cooking, even if they’re in another part of the space. Alternatively, you might choose to leave the stove in the island and position the sink below the window to enjoy the view outside while you’re washing up. The kitchen here is tucked in the corner, but the peninsula means everyone in the room can interact with each other.